Originally posted May 23, 2017 on the Tiny Cables Medium publication. I haven’t been able to avoid talking about Tiny Cables lately. We’re a week or two away from our soft launch and I’m pumped — sue me. Given the chance, I wax poetic about the niche we’re going to address and the need for a quality solution. I talk about offering a lifetime warranty and the benefit of blogging this journey. I share the tidbits I’ve picked up about UPC codes, PayPal, and packaging. It was that moment that I realized I had not considered not offering free shipping. Free shipping seemed like a given. When we worked out the per-unit costs in Let’s Give Everyone a Lifetime Warranty, we found on an average of $3.71 to purchase, pack, and ship each cable to a customer. Given our target price of $8, this checked out, and we moved on to the next item on the to-do list. I simply hadn’t considered charging for shipping but we should have. The assumption that free shipping is the universal preference feels a little too much like a given — just to be sure, I resolved to try and blow a hole in this assumption. In this post, I share my research on both sides of the question and two surveys that we ran. Free shipping is cool. According to behavioral economics researcher Dan Ariely (and everyone who I’ve ever met), free everything is cool. Ariely says that people generally overvalue a free item by an average of 14% and it stands to reason that people don’t enjoy being nickel-and-dimed on their way to a purchase. Ariely’s book Predictably Irrational unpacks this in detail — a highly recommended read. People like free. Got it. For the customer, there is one clear reason to oppose blanket free shipping: if you want control over when the item arrives. Some of our customers will want their Tiny Cable the next day while others might feel comfortable waiting for 3–5 days (or even longer). This checks out — we should allow the customer to pay $20 for shipping if they really want to, right? 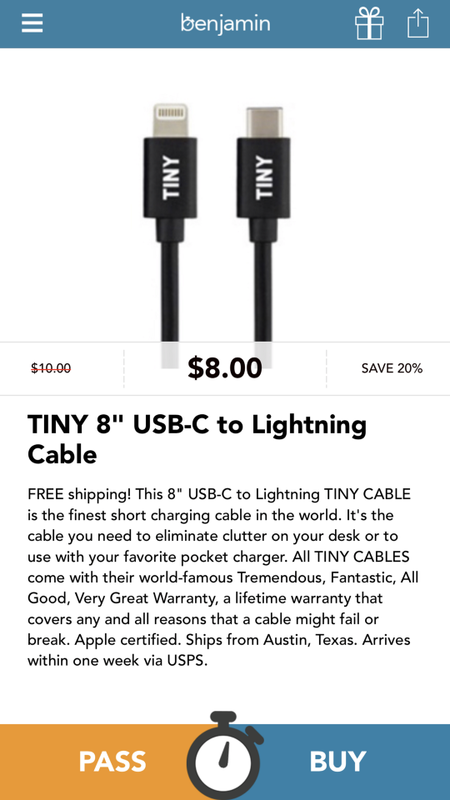 For the Tiny Cables team, there is a larger potential benefit: we could use it as a tool to up-sell. As end-users, we’ve all been $10 away from qualifying for free shipping, which often results in adding an additional $10+ in merchandise to save the $5–15 in shipping. That is what leads 60% of online retailers to cite “free shipping with conditions” as their most successful marketing tool. Even if there isn’t free shipping waiting once the customer crosses an order-size threshold, a group of graduate students at UC Davis and UPenn found that the “imposition of a shipping fee induces higher purchase quantities per visit.” In short: if you’re spending $8 to have an item shipped, you’re likely to purchase additional merchandise so you get the most out of that shipping fee. We might sell more if we charge for shipping. Interesting. To get an idea of how shipping might influence a Tiny Cables purchase decision, I set up a quick and dirty survey of people that work in the same San Francisco co-working space that I do. I was able to get 29 people to look at five randomly-selected products (presented in the benjamin app) and tell me whether they would buy or pass. Each individual was offered three apparel items (specific to their respective genders), one digital delivery good, and one Tiny Cable. None of those surveyed were aware of Tiny Cables or my involvement in Tiny Cables before the survey. Some of the Tiny Cables listings had a shipping rate listed, others did not. The purpose of this survey was to gain an understanding on which listing appeals more: one with a specific shipping price or free shipping. For the purposes of this survey, we made each total $8.00. TINY CABLES in the Benjamin mobile app, something that people should get used to seeing. Overall, Tiny Cables earned the highest buy-rate. 48.2% of respondents said they would buy one. The second highest buy-rate was for a Pandora Premium deal (3 months for $3) at 34.4%. Free shipping out-performed paid shipping: ten respondents said yes to free shipping and only four said yes to paid shipping. Seeking more input, we ran a Twitter poll. Only twenty-four people participated, sure, but it’s something. One of the great pains of the internet is adding a $10 item to your cart only to find that the store wants an additional $6.99 for shipping. It’s not unlike a 30-second video advertisement playing before a 45-second clip. Given that, and despite evidence of a potential benefit (the opportunity to upsale), we’re going to ship for free. My personal view is that doing so aligns the company with our core transparency value and it makes for a simple experience. I like the fact that we’ll offer both free shipping and a true “no matter what” lifetime guarantee. That just feels right.